Stop using unsecure and incomplete email, voicemail and verbal communications to make contract requests! With Contract Logix Premium contract management solution, you can enable anyone to quickly and accurately submit an existing contract, request the creation of a contract, or even instantly create a contract themselves via its simple, yet powerful intake interface. With minimal training even users who do not have full system access, can use the form-driven feature that leverages your pre-defined contract types, data fields, business rules, and workflows. It will prompt your users to provide all the information required to produce a contract that meets all your organization’s legal and accuracy standards, without the need for double data entry or the need to chase down missing data. And creating the request forms themselves is almost as easy as filling them out and requesting them. Just drag and drop the fields you want included on the form, pick the workflow you’d like the request to follow, and make the intake form available to the appropriate roles. The Contract Request Box for Selecting Contract Type. Increases speed and accuracy of contract creation. Helps ensure contract compliance and minimize risk. Centralizes and standardizes control and communication of intake requests. Enables request and submission capabilities without providing full system access. 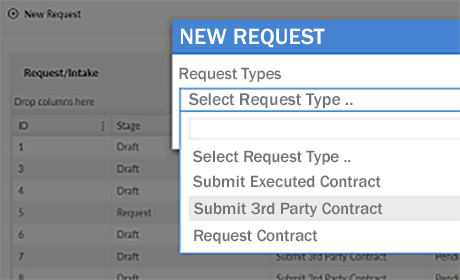 Our Premium contract management software product includes all these request and submission features to centralize your contract in-take process. Create unlimited forms for unlimited contract types so users can quickly provide the request details and submit the information to the system. Configure the request forms to meet your organization’s needs, match your naming conventions, required fields, workflows, etc. Produce a finished contract document leveraging data from the request form, contract types, and your clause and template library. Manage your process through contract execution leveraging your specific business rules and workflow processes. Submit supporting documents to be attached to the resulting contract record in your contract repository. Empower your staff, partners, resellers, or customers to submit requests via any browser, any device type, any time, anywhere. These are just a few of the features and benefits that come with our intake request and submission functionality. To find out more about all the software’s capabilities, please schedule a live system demo. We’ll walk you through it, from start to finish. IS PREMIUM RIGHT FOR YOUR COMPANY?